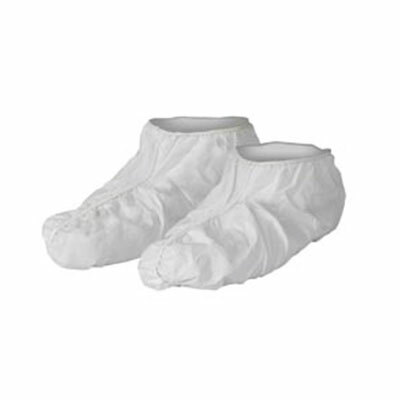 Kimberly-Clark Kleenguard A40 Liquid & Particle Shoe Cover 44490 is made of breathable, microporous film laminate, fits shoes up to size 13, come with elastic tops, and protect against non-hazardous liquids and airborne particulates. Shoe Covers offer better liquid barrier, particulate barrier, and are lower in lint than Tyvek too. Passes NFPA 99 criteria for antistatic materials. Kimberly-Clark helps break the transmission of germs in the workplace with innovative products and hygiene-based wellness programs, so your team performs at their best. They provide an extensive range of safety equipment and educational programs, so both your hardware and your employees have the highest level of protection. With a LEAN-focused evaluation process, your employees are armed with the right products and advise them on best practices to work more intuitively and efficiently. They’re more confident, and your workplace is more productive.